And when evening came, the owner of the vineyard said to his foreman, 'Call the laborers and pay them their wages, beginning with the last, up to the first.' And when those hired about the eleventh hour came, each of them received a denarius. Now when those hired first came, they thought they would receive more, but each of them also received a denarius. And on receiving it they grumbled at the master of the house, saying, 'These last worked only one hour, and you have made them equal to us who have borne the burden of the day and the scorching heat.' But he replied to one of them, 'Friend, I am doing you no wrong. Did you not agree with me for a denarius? Take what belongs to you and go. I choose to give to this last worker as I give to you. Am I not allowed to do what I choose with what belongs to me? Or do you begrudge my generosity?' So the last will be first, and the first last. If you're like many people, you probably read this passage and think to yourself... "Well, that's uncomfortable, so I'll keep reading until I get to something I understand and makes me feel good." But we do ourselves a great disservice by skipping over challenging parts of the Bible. God is revealing Himself to us, giving us an opportunity to draw closer to Him. To learn about Him. To get to know who He is and what makes Him tick. What a privilege! So what can we learn about God from this passage? The most obvious is this: God is unfair. His generosity isn't equitable; it doesn't coincide with work load or hours. He is more generous to some than to others. And if we're all honest, this makes us a little uncomfortable. So let's ask the question that those morning workers asked, "Why didn't those who worked more get paid more?" Here are some things we can learn from God's response. Friend, I am doing you no wrong. Did you not agree with me for a denarius? Take what belongs to you and go. God might not be fair, but he doesn't wrong anyone. He is just. His point to those morning workers is that He paid exactly what He said He would. And they agreed to this. He fulfilled every promise that was made to those workers. There is no reason they have to be angry with Him. GOD CAN DO WHAT HE WANTS WITH WHAT IS HIS. I choose to give to this last worker as I give to you. Am I not allowed to do what I choose with what belongs to me? 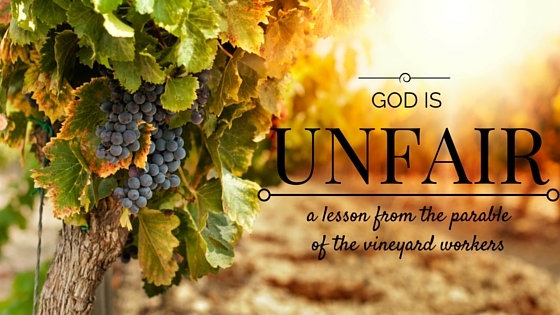 In this parable, the vineyard is His and all the money belongs to Him. He didn't have to hire those workers at all. It was a gift to be hired in the first place. What right does a worker have to demand more from Him? Absolutely none. Here is the root cause of the frustration of the morning workers: they despise the generosity of God. Why? Because they weren't the primary recipients and they worked more hours. They felt more deserving of His generosity. Apart from God's grace we are all hardwired to think "Me first!" To view the world in a sense of wages: I worked this hard, I earn this amount of benefits. But God's ways are not our ways: the last have the greater benefits. For those who think God owes them something, He often is harsh with. For those who feel undeserving and unworthy, He delights in blessing. If those morning workers had been the only ones in the vineyard that day, there wouldn't have been a problem. But in comparing themselves to the other workers they assumed they were entitled to more. Then the master paid them all the same. They felt insulted to be treated the same as everyone else, after all they had worked harder. In the same way, the Pharisees of Jesus' day were enraged to hear Jesus extend the same offer of grace to Gentiles, prostitutes, and tax collectors as He did them. After all, they had worked their whole lives to keep the law of God and follow His ways. They had worked harder than anyone! It couldn't be right that God would be as gracious to a common sinner as to an advanced Pharisee. Have you ever been upset when someone "younger" in the faith or someone who hasn't served God as long as you is honored or gets offered that leadership position you wanted? Then you know exactly how the Pharisees felt. They longed to be treated fairly, to be treated as they deserved. Here is the problem: they were already treated better than they deserved. And the same is true of you and me. In actuality we deserve one thing. The only wages we have ever truly earned in this life: wrath. If you desire a fair God, as those morning workers did, here's what that means. Everyone received the wages they earned, in this case that is death. Eternal death. Everyone except one person, the only Righteous One to set foot on our planet: Jesus. Jesus would receive all the benefits of His perfect life. But that isn't what happened. Instead, God chose to lay the punishment of the unrighteous on the only Righteous One. He punished the Innocent for the crimes of the wicked. He forsook the holy One and welcomed the sinners. I don't know of a more unfair act in all of history. You have believed the lie that God owes you something more than wrath. You think you have earned your favor with God, that your standing with Him is based on works. You think your sin isn't as bad as others' sin. You perceive yourself to be better than others. Let us repent for thinking more of ourselves than we ought. Let us repent of being upset by the gracious heart of our God toward others. Let us repent of looking down on the sins of others, when we ourselves are capable of the same evil apart from His grace. Praise be to our God that He isn't fair and doesn't give us what we deserve! He isn't fair, but He is just. Sin never goes unpaid for. He always punishes evil. But in His grace, He satisfied His justice while pardoning sinners through the bloody sacrifice of a perfect sin offering: Jesus, the righteous.